(CNN) — Millions of people unaccustomed to heavy rain will get walloped by Tropical Depression Rosa on Tuesday. 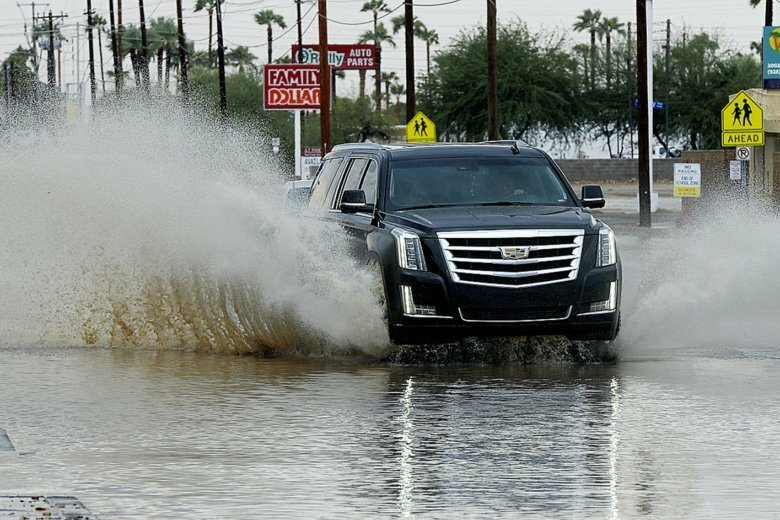 The storm has already dumped torrential rainfall on Mexico’s Baja California and created a bizarre sight in the desert city of Peoria, Arizona: flooded roads. As Rosa trudges northeast, the storm will dump 2 to 4 inches of rain on much of Arizona and up to 6 inches in the mountains. And given Arizona’s terrain, heavy rainfall poses an unusual set of problems. The National Weather Service’s office in Flagstaff warned residents to avoid the state’s famous slot canyons and any campsite near creeks. Historically, it’s unusual for the US Southwest to get pummeled by a hurricane or tropical storm. But “these events have begun to increase in recent years,” CNN meteorologist Gene Norman said. Research indicates global warming contributes to tropical storms getting “more intense, bigger and longer-lasting, thereby increasing their potential for damage,” said Kevin Trenberth, senior scientist at the National Center for Atmospheric Research. While there might not be a direct link between global warming and the recent increase of severe storms in the Southwest, “it is possible that this could be a side effect of climate change,” Norman said.